In a large saucepan, heat oil over medium heat. Add leeks and garlic and sauté until golden and translucent. 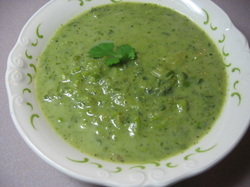 Add peas, parsley, chives, and water and simmer for 10 minutes over low heat. Puree ½ of mixture in a food processor until smooth. Add pureed mixture back to the pot along with Rice Dream. Gently reheat but do not continue to cook. Taste and add salt or Braggs Liquid Aminos if desired.